Fiat 500C Abarth Essesse review | What Car? What is it? 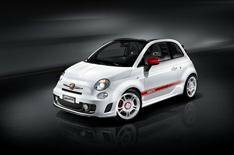 Abarth version of the 500C with a manual gearbox. We first drove the Fiat 500C Abarth Essesse over a year ago, but back then it came with only a semi-automatic paddle-shift gearbox. Now you can buy it with a five-speed manual gearbox. At 16,856, it's 1000 less than the semi-automatic model, but the version we drive here has the Essesse pack fitted. This adds about 3200 (depending on fitting costs) to the price and brings a more powerful engine, as well as lowered suspension and 17-inch alloy wheels. What's it like to drive? In a word 'frustrating'. All the elements of the car sound as if they should add up to something pretty special, but they actually work against each other. Take the sports suspension. You'd expect it to make the 500C sharper and more enjoyable to drive and drive fast but it's quite the reverse. It makes the ride so firm and so uncomfortable that you soon come off the throttle. On the sort of roads that should induce a grin, you end up with a grimace. Ironically, the engine's extra power is the car's worst enemy, because it means you hit the bumps at a higher speed and in other words harder than you would in a less powerful version. To make matters worse, the engine is a wonderfully rev-hungry little thing that sounds better the more revs you give it and responds really sharply in Sport mode. You can't help but rev it hard and use the full performance but all too often you regret it. The car has plenty of grip, but again you can't really use it to the full, because the steering doesn't have enough feedback: it's too light in its normal setting, and while Sport mode does give it extra weight, it's an artificial weight that gives no extra feedback. It's also slightly irritating that the engine can bog down when you move off in first gear, and that the turning circle is larger than expected. Until you're used to it, you can find yourself turning into a parking space and missing. The one area where this new version is better is its gearshift. The semi-automatic gearbox gives jerky gearchanges and you have to press separate buttons to engage first and reverse gears, which is annoying. This car's conventional five-speed manual unit doesn't have the slickest of changes and the widely spaced gear ratios make it hard to keep the engine on the boil, but it's far better than the semi-automatic 'box. What's it like inside? In look and feel, the 500C Abarth is a step above the regular 500C, with neat touches such as the turbo boost meter on the top of the dashboard. At the same time, it shares the regular 500C's failings. You sit up very high, which detracts from the car's sporty feel, and the footrest feels uncomfortably high. It's not too bad for practicality, though. The rear seats give a little more legroom than in some rivals, and the boot is only slightly smaller than the hatch's. Should I buy one? Buy a 500C by all means, but don't buy this one. Not only will it cost about 20,000 with the Essesse pack, the over-firm ride makes the car almost impossible to live with. A less powerful version and that includes the standard Abarth makes a far better buy.